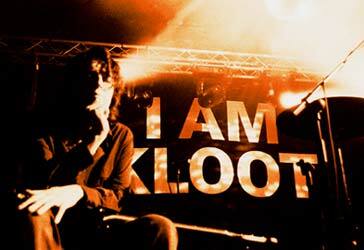 I Am Kloot are the unsung heroes of the maverick Mancunian music scene. Despite releasing two outstanding albums, touring solidly and having critical acclaim most bands can only dream of they still haven't had the success they so richly deserve. That could be about to change as tonight's show is being filmed for video, TV and the internet so this media boost could be just what the band needs. As the lights dim and the await the arrival of the band I feel I'm about to witness something very special indeed. After the stirring, melodramatic intro music I Am Kloot take their respective places. Playing songs from both their albums I Am Kloot are on cracking form throughout the entire performance. Johnny Bramwell's voice shimmers and quivers with such eloquence, each not so beautifully realized, investing genuine emotion, heartache, longing delivered with sardonic wit and an honest and northern-ness his lyrics possess. He does this while playing the guitar so effortlessly, intricately like the master musician he is. Boasting Andy Hargreaves on drums and Peter Jobson on bass they provide and understated backing if not one of the best rhythm sections in the country. And you want great songs? You've got em. "Twist", "Stop" and "From Your Favourite Sky" sound even better live and with Troupe, the dancing girls from the bands last review tour, making a re-appearance we even get a touch of music hall vaudeville for the new millennium. The majestic "The Same Deep Water As Me" played tonight really tugs at the old heart strings, a ballad so moving and subtle that it could melt even the hardest of hearts. The rocky "Life In A Day" rounds off the set. Despite not having an encore planned the crowd plead for more and eventually Johnny Bramwell returns with an old song of his which ends the evening in triumphant style. At a homecoming show like this you'd expect to spot a few local famous faces, but with the exception of Andy Rourke skulking around it was mainly I Am Kloot's devoted and loyal fans who made up the audience. Tonight's gig was the return of Manchester's prodigal sons who delighted everyone with a set full of wondrous and timeless songs.